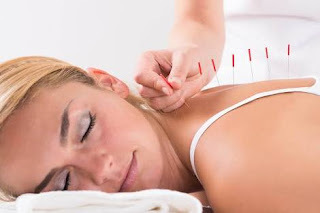 Acupuncture is a form of traditional Chinese medicine administered by inserting needle into the body. Well it is not completely proven by science but clinical trials and research has shown that it act as a pain reliever. It is very effective in treating acute back pain. American Society of Anesthesiologists states it may be considered in the treatment for nonspecific, noninflammatory low back pain only in conjunction with conventional therapy. Well the practice of inserting needles into the body is not the only form of acupuncture, but it is common among US. In Nigeria, one similar acupuncture practice is the act of placing insertion on the head. Research in this case has shown that such practices and the phytotherapy added to the insertion has proven to be a good form of antibiotics. This practice is common in the Igbo speaking part of Nigeria. Also in the Yoruba speaking community the place marks on the body with other insertion to cure ailment. But it's not always reveal and it's a little diabolical. To know more call me.